Purell hand sanitizers provide you with the ultimate defense from germs and illness. Unlike discount hand sanitizers which might only kill some germs, Purell hand sanitizers eliminate 99.9% of the common germs that cause colds and flus. This is why the health care industry across the country turns to Purell to keep their facilities clean and safe. When flu season sneaks up on you, you'll want to have lots of Purell refills on hand. 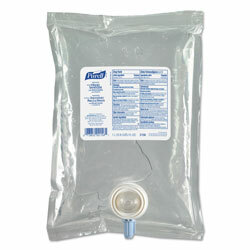 These Purell refills are meant for use with a 1,000 ml dispenser (also available at ReStockIt.com). You have your choice of several units meant to work with these refills. There are other hand sanitizer brands out there, it's true. But when you're talking about health, do you really want to gamble on discount hand sanitizers, especially when you get this great Purell product at ReStockIt.com at discount prices? Trust the leader in all hand sanitizer brands by going with this excellent refill product from Purell. ReStockIt.com carries a complete line of hand sanitizers - check them out today! PURELL® hand sanitizers are the most effective way to fight the spread of germs. You can use Purell ½ oz. bottles, Purell wipes or Purell 8oz. sanitizers. And with flu season upon us, you'll want to use Purell® hand sanitizer refills, 1,000 ml. Purell® hand sanitizers, Purell wipes, Purell ½ oz bottles and Purell sanitizer refills are the most economical way to fight germs. This hand sanitizer refill is best when paired with a 1,00 ml dispenser (dispenser sold separately). Purell hand sanitizers and refills are designed to use with Micrell®/Purell® NXT® Side-by-side Dispenser, Provon® NXT® Side-by-side Dispenser and Purell® NXT® Space Saver Dispenser (sold separately). Purell® sanitizers, Purell 8 oz. sanitizers and Purell wipes are dermatologist tested and dye-free. You can easily refill your dispensers with the Purell® NXT® Instant Hand Sanitizer Refill, 1000-ml Bag. Purchase it today, along with Purell ½ oz. bottles, Purell wipes and Purell 8oz. sanitizers. INNER PACKAGING: 1 Refill. 1,000 mL per Refill. mL - 1000 Hand Sanitizers from Purell! 989 In Stock today. I love this sanitizer - it does not dry your skin. I use this in my home bathroom. I think every home should have one of these sanitizer - it is much better than the pumps you purchase at your local stores. I ordered this for a friend because she could not find a refill any where for the bottles she had. Thanks so much for having this product.